Let the celebrations begin with this beautiful birthday charm from Nomination. The perfect gift to give your loved one they can cherish on their bracelet forever. Font quiet small but very nice when you close up look at it. Font is fancy, it appears very elegant. Got as a gift for my 21st and adore it. 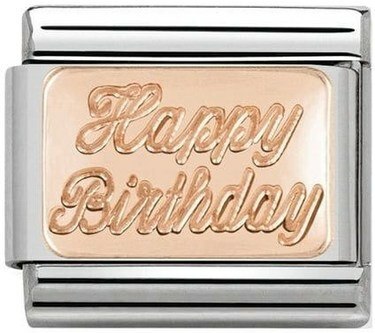 There is an option to customize your own on a rose gold plate or gold plate but due to font being small I would recommend sticking with the basic ‘happy birthday’ rather than trying to squish age and a name in. Very good for price.